We visited this park on November 7, 2017, and stayed for 14 day(s). 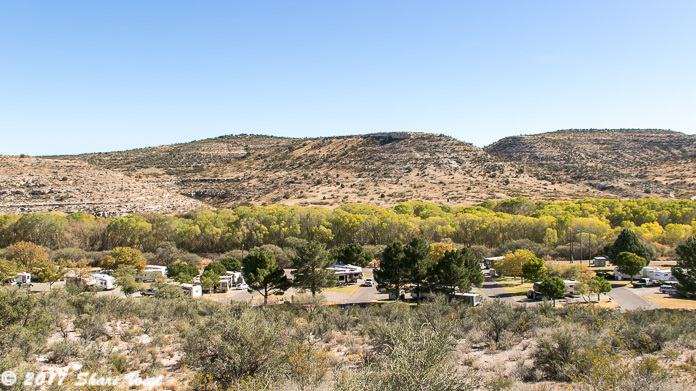 With this third visit to Thousand Trails Verde Valley, it has made our list of favorite RV parks. In early November, this area has 70ish degree days with clear, blue skies, and upper 40’s for nighttime temperatures. This makes it perfect for daytime hikes and working with windows open. It’s quiet, rustic, and autumn colors are just making their appearance along the Verde River, bordering the eastern edge of the campground. We’re in C-41 this time, a 50 AMP, full hookup site with a fairly level gravel pad, a couple of pine trees, picnic table and old-style charcoal grill, and unfortunately, a humming transformer box. Note that to get a 50 AMP site, it’s necessary to call the park office. While 30 AMP sites are ‘pick your own’ – 50 AMP sites are few in number and assigned. Reserve early. This picture is from our stay in September, 2016. It’s a short walk to the pool, hot tub, and member lounge from our spot, but doing laundry will require the car as the laundry room is in Section H. Yes, it’s a fairly good sized, spread out park. Our Verizon coverage in section C is marginal. As of this writing, I’m getting only 1-2 bars of LTE. But our AT&T coverage is strong, so we’re making good use of our AT&T Mobley to get work done. Last year, in section H, we only had the Verizon option. The signal was so poor that we regularly resorted to climbing the hill to the office to work on their back patio. It still wasn’t good there, but much better than at our site. When we needed more oomph to get some work uploaded, we’d visit the Cottonwood library or the Starbucks in Camp Verde. 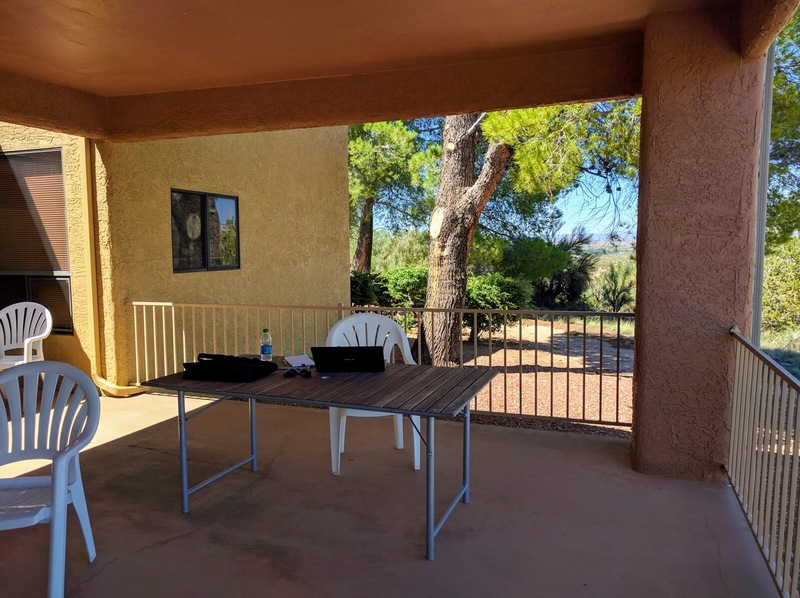 The Thousand Trails Verde Valley office patio in use as my outdoor office with a view. The nearest town to Thousand Trails Verde Valley is Cottonwood, where you’ll find a Walmart, Safeway, Fry’s, and numerous restaurants. On the other side of Cottonwood, take a short drive up Hwy 89-A to visit Jerome, a National Historic Town (5200′ elevation) built into the mountainside, near the top of Cleopatra Hill. It’s an old copper mining town, reborn as an artsy community with a checkered past. If you go, be sure to check out the Haunted Hamburger, our favorite eatery in the area. If you’re unfamiliar with Thousand Trails parks: This is a membership-based RV park system that we bought into during our first winter as full-timers. There are several membership levels, with the entry level being your basic zone pass, for which you pay a modest annual fee and get 30 days free in the system, then $4 per night thereafter. You can stay in your zone parks for 14 days at a time, then must leave the system for one week before being eligible to stay for another 14 days, and continue in this fashion throughout the year, rotating in and out. It’s an inexpensive way to try them out if there are Thousand Trails parks where you want to RV. We purchased the next membership level – Elite, which came with a heftier price tag but allows us unlimited time in the system nationwide. Depending on where work takes us, it can be a very good deal or not. There are few parks in the midwest, where we spend our summers, but rely heavily on Thousand Trails parks when we’re on either coast or in the south. There are more options for memberships, some including more parks than others, some with more perks. You can buy new through a Thousand Trails salesperson or used through a broker. Just make sure you know what’s in your contract. There are enough variations to make your head spin. Come December our Thousand Trails Collection add-on will kick in, which will greatly expand our options because now we’ll also have free access to several Encore RV Resorts. 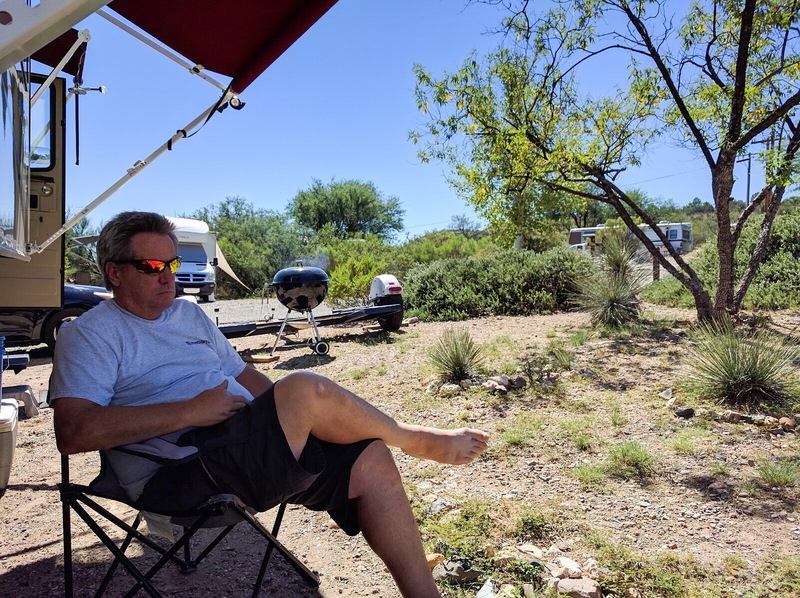 Between our regular membership, this add-on, and our Escapees membership (which I’ll describe in another review), we’ll have zero-to-cheap, nice RV sites throughout this winter in Arizona and southern California. Disclaimer: If you’re looking for a high-end resort, Thousand Trails will disappoint you. These are rustic properties with some resort amenities – usually a pool, hot tub, and one or more activity lounges. Many parks are in sad need of maintenance, but the good news is that some parks are indeed improving between visits. Thousand Trails Verde Valley is a good example of this. They’re in the process of upgrading the electrical system, and there are many more 50 AMP sites this year than last. The pool has had improvements; a new hot tub installed; new patio furniture; and general cleanup of undergrowth is occurring. If you’re interested in learning more about Thousand Trails, leave a comment or send a message through our contact page.